Equipped with the latest tactical suit and goggles, Batman, from the Justice League,, is now available as a Play Arts Kai action figure! The sculpting of the protective gear covering his brawny physique has been meticulously realized down to the minutest detail. 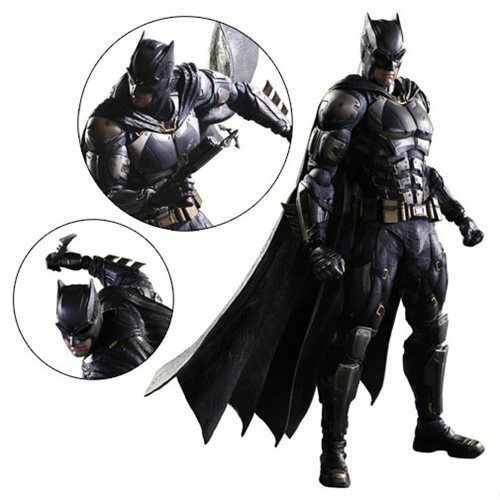 The Justice League Batman Tactical Suit Version Play Arts Kai Action Figure features an accentuating contrast, and the paintwork elevates the figure's overall presence. The texture of the inner suit is given a lifelike three-dimensional quality with the use of dry brush techniques. The metal parts of the figure have been treated with a weathering effect for further realism. The Justice League Batman Tactical Suit Version Play Arts Kai Action Figure measures approximately 11-inches wide x 10 1/3-inches tall x 4 1/4-inches long, comes with includes display stand, and is packaged in a window box. Ages 15 and up.